Welcome to the official R4 3DS online store! 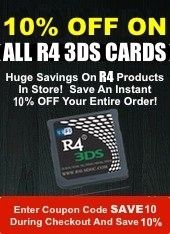 We stock and ship only the genuine R4 cards for the new Nintendo 3DS XL systems. 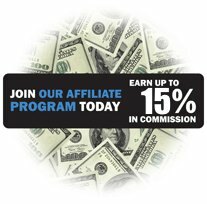 What can you do once you have one of our cards? The possibilities are truly endless. Your Nintendo 3DS / 3DS XL will never be the same again. Imagine being able to download and play several hundred freeware games and applications, or quickly converting your movies and watching those movies on your 3DS console. It's all possible. The newest version of our card has Moonshell built right into the OS, allowing you to enjoy the full multimedia experience you've come to expect from the R4, without the hassles of having to install any software. 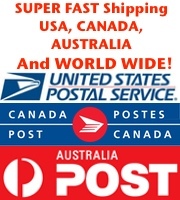 Your MP3 music, ebooks, videos, and digital photos will all come to life on your new handheld game system. Turning it into the best multimedia handheld you'll ever find. R4 3DS 11.3.0 Update Now Available and Compatible. The R4 3DS Brings Apps, Games, And More! 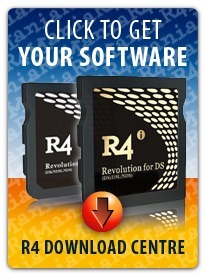 With apps for Facebook, Twitter, Web Browsing, and more, you will never run out of things to do with your R4 3DS. Everything from remakes of old classic games for old computer and video game systems, to being able to play some of your favorite consoles games of yesterday with emulators for the most popular game systems. You'll be able to play NES games, SNES, TG16 games, NeoGeo games, Gameboy and Gameboy color games as well as run thousands and thousands of classic computer games for systems like the ZX Spectrum, the C64, BBC Mirco and others. Imagine being able to take all of those old systems with you, all on your Nintendo hand held and having them all in one place - ready to play whenever you feel like it. Use inexpensive micro SD and micro SDHC cards to both store and load your games and applications and enjoy them all on your 3DS system. Our cards are always up to date, and we work hard to have any future firmware updates and upgrades ready to use... Often within days of a system update to your handheld.